Cherrapeno: Chocolate Delice - Oh Yes!! I admit, I usually want to scream "why?" when I hear of yet another special day or week to commemorate different foods, there's national cucumber day, walnut, gummy worm, celery day month (no kidding). I could go on - just google (insert food) + day - you might be rolling your eyes too! But... this week it's 'chocolate week'!! And I don't care who thought this one up, I love them! C H O C O L A T E ! Here is my contribution, a wonderful chocolate delice that I spotted on MasterChef Australia, where the contestants had to make it as one of their challenges. I made this for my son's birthday dessert, he wanted something with chocolate that was a little different to the usual birthday cake offering. It's one of those desserts that looks quite complicated, but each layer is easy to make and assemble. 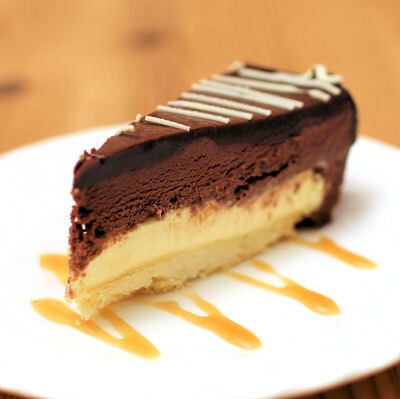 Serve with a salted caramel sauce! 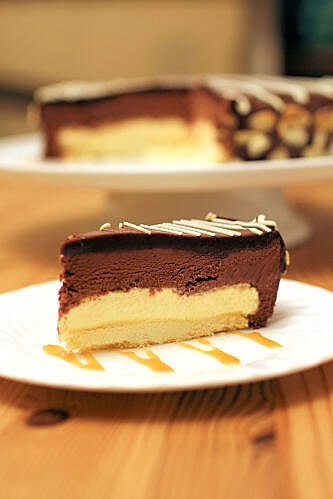 Here is the link to the original recipe by Eamon Sullivan, Chocolate Delice with Salted Caramel. I did make a few changes, the amount in his recipe is for 4 individual ones, I made a single large one using an 8" cake tin for the shortbread base and crème brûlée. I cut the ingredients down as it seemed rather a lot for 4 people and my chocolate mousse was gelatin free. As the delice is very sickly rich, serve small portions. Here's a rough guide which may help if you want to attempt it. Make the shortbread base and the crème brûlée first. I used cake tins (8") for both and my crème brûlée was a 5 egg yolk one. Freeze the crème brûlée once cooked and cooled. Make the choco cream - I simplified this by making an easy chocolate mousse using 350g dark chocolate melted with 100ml double cream, then folded this into 300ml of lightly whipped double cream. Put the shortbread round onto a large plate and top with the frozen crème brûlée. Put an adjustable cake ring round the shortbread, making it about half an inch bigger (or you can use a ring from a cake tin that is about 8½" wide). Pipe or spoon the chocolate mousse down the sides of the shortbread/brûlée (in the bit of space around it) and onto the top. Smooth it out using a spatula and put the whole thing into the freezer until frozen. Make the chocolate ganache - 200g dark chocolate to 150ml double cream. Remove the delice from the freezer and carefully remove the ring. Pour over the chocolate ganache, spreading it around the sides and smooth the top. Lift the delice onto a serving dish or cake stand. 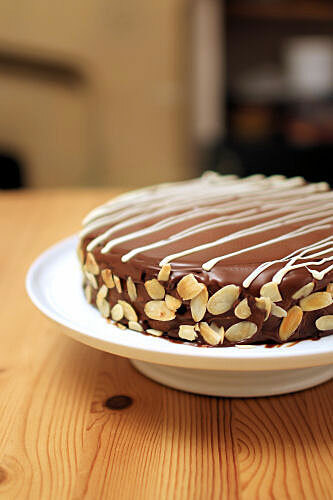 Drizzle with melted white chocolate and decorate the sides with roasted flakes almonds. Refrigerate until needed. 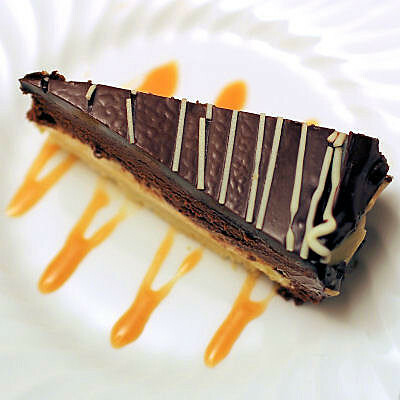 Make the caramel sauce and pour a little onto the serving plates, top with slices of the delice. that's so pretty, nic! bonus--the flavor must be out of this world. Oh wow that looks sensational! I've love a big slice right now and its only breakfast time. What an incredible-looking dessert! Would make a stunning centrepiece finale for a celebration meal. Pleased to have 'rediscovered' your blog after a long break from blogging. What a beautiful dessert. A stunning centre piece. Lucky son having this dessert on his birthday! Looks like an exquisite dessert to me Nic and so professional looking. I'm sure your son loved it!